This teloscope has not been used for some time. To be honest I know very little about it. I have asked my son and he says it was used very little but may need to be calibrated. It was bought for £165. 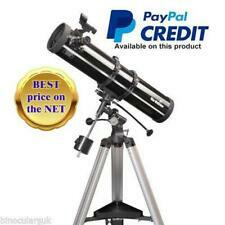 Sky-Watcher Explorer-130 EQ2 Reflector Telescope. As from photos it has lenses, instructions and a never used clock drive which keeps the telescope following a star or planet. The telescope has very little use but has slight rusting to chrome parts. See photos for more info, sorry but collection only from south lakes. Red Dot Finder for easy location of objects. Pre-assembled mount and aluminium tripod. Includes convenient wall-to-wall accessory tray. EQ5 Deluxe Heavy-Duty Equatorial Mount. BBC Sky At Night Magazine. 77% more Light Gathering than 150mm. 1.75" Stainless Steel Pipe Tripod with Accessory Tray. Eyepiece Supplied (1.25"): 10mm & 25mm. 9x50 Finderscope. With its long focal length and breathtaking, diffraction limited optical performance, it is ideal for the detailed high-power study of the Moon, Double-Stars, Planets and other objects in our solar system, providing crisp contrasty images. EQ2 Equatorial Mount. We will always help you to have a 100% positive happy buying experience. Magnifications (with optics supplied): x36, x72, x90, x180. 30% more Light Gathering than 114mm. Aluminium Tripod with Accessory Tray. EQ2 Equatorial Mount. MPN : 10724. Astronomy Binoculars. Baby Photo Albums. Camcorder Case. Image & Recovery Software. We endeavour to dispatch all orders within 24 hours excluding weekends. They are ideal for the detailed high-power study of the Moon, Planetary Surfaces and other objects in our solar system, giving crisp contrasty images. MPN : 10713. The 900mm focal length allows very high power magnifications to be achieved easily without employing uncomfortably short focal length eyepieces. Astronomy Binoculars. EQ2 Equatorial Mount. • EQ2 Equatorial Mount. • Red Dot Finder. We will always help you to have a 100% positive happy buying experience. In addition they feature 0.5mm Ultra-Thin secondary mirror supports, to reduce diffraction spikes and light loss. Its extensive database includes a massive 42,900 night sky objects. They employ super-high contrast optical systems, utilising high-transmission multi-coatings on all optical services, for optimum optical performance. Red Dot Finder. In addition it also has a shorter focal length resulting in brighter views of fainter objects such as distant galaxies and nebulae. "The quality of the star images cannot be faulted, and a higher magnification of Mars showed surface detail well". Its extensive database includes a massive 42,900 night sky objects. EQ3 Pro SynScan GO-TO Equatorial Mount All Sky Watcher Black Diamond Newtonian Reflectors feature 0.5mm ultra-thin secondary mirror supports to reduce diffraction spikes and light loss, and high quality Paraboloidal primary mirrors to eliminate spherical aberration. EQ5 Deluxe Heavy-Duty Equatorial Mount. About the EQ5 Deluxe Heavy-Duty Equatorial Mount The mount rests firmly on a large, adjustable stainless steel pipe tripod with accessory tray. Free to England, Wales and parts of Scotland, excluding Highlands and Islands, Isle of Man, Northern Ireland & Isle of Wight. No effort is spared to reach optimal optical quality. Astronomy Binoculars. EQ3-2 Deluxe Equatorial Mount. Red Dot Finder. Baby Photo Albums. Camcorder Case. We endeavour to dispatch all orders within 24 hours excluding weekends. Focal Length; 38mm. Debit Card. 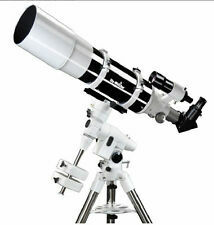 Sky-Watcher Explorer-130 EQ2 Reflector Telescope. Condition is good used. No original box but will be very well packed for your courier to collect or for personal collection from North Cornwall. With everything working as it should, handbook, instruction manual, alternate lens and Turn Left at Venus hardback book to get you started. UK only auction, please do not bid if you have less than 10 transactions. No buy it now the auction will run to its conclusion. 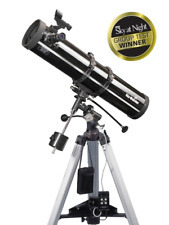 Skymax Black Diamond Series Maksutov-Cassegrains. Available in apertures of 127mm, 150mm and 180mm. Excel for high-power, high-resolution and Planetary applications. They employ super-high contrast optical systems, utilising high-transmission multi-coatings on all optical services, for optimum optical performance. The Sky-Watcher HEQ5 PRO SynScan is designed with the novice user in mind. All Sky Watcher Black Diamond Newtonian Reflectors feature 0.5mm ultra-thin secondary mirror supports to reduce diffraction spikes and light loss, and high quality Paraboloidal primary mirrors to eliminate spherical aberration. EQ1 Equatorial Mount. MPN : 10796. Astronomy Binoculars. Magnifications (with optics supplied): x36, x72, x90, x180. Baby Photo Albums. Camcorder Case. Secure Digital SDHC. Secure Digital SD. The Sky-Watcher EQ6 PRO SynScan is designed with the novice user in mind. A Dual-Speed 10:1 ratio focuser is now included for excellent focusing precision. Even better performance for astro-photography and visual use can be achieved when used in combination with Sky-Watcher’s Newtonian coma corrector (Product Code 20233. ). EQ1 Equatorial Mount. Magnifications (with optics supplied): x36, x72, x90, x180. x2 Barlow Lens. 1.25"/31.7mm Star Diagonal. 6x24 Finderscope. Astronomy Binoculars. Baby Photo Albums. Camcorder Case. Parabolic Primary Mirror. 0.5mm Ultra-Thin Secondary Mirror Supports. Professional Tripods. Remote & Cable Releases. Cokin Filter System. It allows the user to set any object or to start a guided tour of the night sky with just the push of a button. The extensive database contains over 42,900 objects of the night sky. 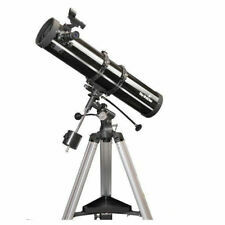 It is provided with the 6x30 finderscope that is designed for accurate and fast object positioning.